Beyond Sausage Now at Whole Foods Markets NATIONWIDE! Just in time for grilling season… our breakthrough plant-based sausage that looks, sizzles and satisfies like pork sausage, is hitting grocery stores shelves NATIONWIDE! Available in three mouthwatering flavors, Original Bratwurst, Hot Italian and Sweet Italian, Beyond Sausage can be found at Whole Foods Market stores next to The Beyond Burger, making for the ultimate summer grilling duo. Sold in four-link packages, they will be popping up on shelves over the next few weeks so be sure to call your store ahead of time! 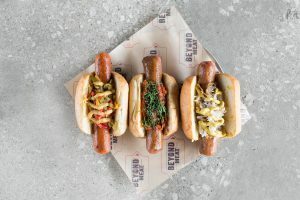 "Consistent with our mission to enable consumers to Eat What They Love™ while enjoying all the benefits of plant-based foods, we are excited to launch Beyond Sausage with our long-time partner Whole Foods Market" said Ethan Brown, CEO of Beyond Meat. "This is the first retail product off of our pork platform, one where we've invested in diversifying plant proteins and creating greater texture complexity. As with any first iteration, we are eagerly awaiting consumer feedback and hope they enjoy it as much as we do." "When I first tried Beyond Sausage, I was blown away by how closely it reminded me of pork sausage. There is a complexity with sausage and yet it is so versatile, making it one of my favorite products to work with as a chef," said Mendelsohn." Step-by-step directions to create Spike's Beyond Brat build at home can be found here. To create the missing link, we used our cutting-edge process to organize each ingredient to deliver against the unique texture of pork sausage. By braiding together proteins, fats, minerals, and water, we were able to re-create the basic architecture, and thus texture, of meat. Peas, fava beans, and rice provide the protein, trace amounts of beet juice lend the meaty red color, coconut and sunflower oil ensure mouthwatering juiciness and a 100% plant-based casing derived from algae brings it all together.